If you want to see results when you pray, let this practical guide help you connect with God's heart and move in His supernatural power. 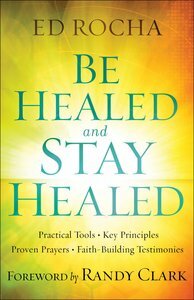 About "Be Healed and Stay Healed: Practical Tools, Key Principles, Proven Prayers, Faith-Building Testimonies"
Ed Rocha holds a degree in theology from the International Bible Institute of London and is currently pursuing his master's degree. After receiving a direct impartation for healing ministry, Ed began to speak around the world and see dramatic healings occur. He and his wife, Dani, split their time between Rio de Janeiro, Brazil, where they are planting a church under the Global Awakening network, and the United States.